If you read yesterday’s Goodreads update, you’ll know that I read a grand total of 70 books this year. 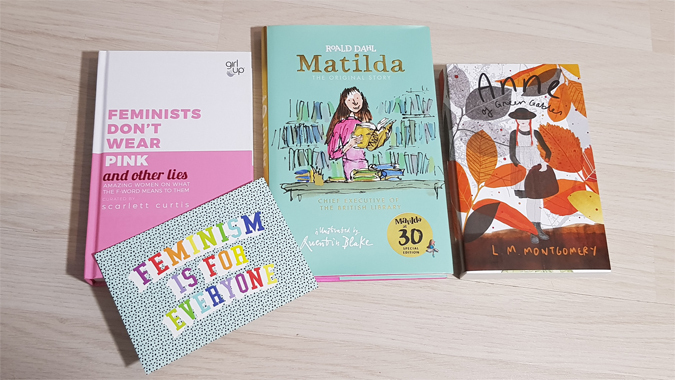 This includes 46 books written by women, 17 titles aimed at younger readers, eight self-help books, six classics and three comic books/graphic novels. Amongst those books are 18 which I would loosely label as diverse, which, for the sake of categorising these books, I’m using to describe books by and/or about people from another country, focusing on mental health, by and/or about the LGBTQ+ community, and by BAME writers (I’d label a further ten books as overtly ‘feminist’). I mentioned in yesterday’s post that I plan to challenge myself to read more diverse titles in 2019. The books which have had a lasting impact on me this year have told stories unlike my own and I’ve found that so beneficial as a reader and writer. I actually accidentally managed all but one of these this year (space), so it’ll be fun to do it on purpose. This fab book subscription service is on a break at the moment but they have challenged fans to read more independently published books. 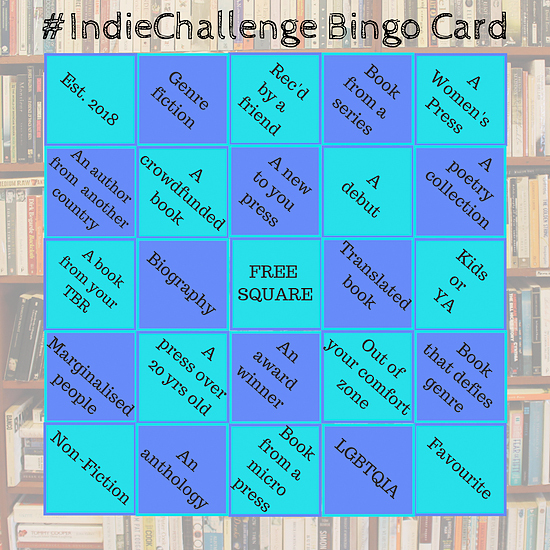 Books read for this challenge must be published by independent publishers or self-published. Books published by any of the ‘Big 5’ (HarperCollins, Penguin Random House, Simon & Shuster, Macmillan, Hachette + imprints) don’t count. There’s also a bingo card! Participants are encouraged to either choose a line or go the whole hog. I’d love to have a crack at the whole thing but for the time being I’m going to focus on the final vertical line (a Women’s Press, poetry, young adult, a book that defies genre, favourite). Another thing I’d like to do this year is read more poetry. I always thought I wasn’t much of a fan but I think I just need to try harder to find something I like. Do send your recommendations. I’m subscribed to Penguin’s mailing list and was really interested in a message which dropped into my inbox the other day. To support readers with their challenges, they’re sending tailored monthly updates, depending on whether you’re looking to ‘expand your mind, keep up with the big hits, discover the best contemporary writing or read the books you always meant to read’. I ticked ‘expand your mind’ and I’m definitely on the right track – the first list of suggestions included Feminists Don’t Wear Pink and Other Lies, which I gleefully received for Christmas. 4. My final Challenge is community focused and is hosted by Blogger’s Bookshelf. I can’t wait for Vicky to bring back her #bookchat in the new year. I love the book blogger community. Which one/s would you prioritise? 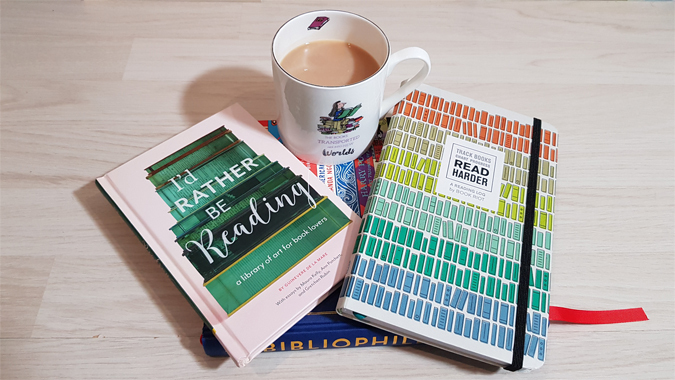 Are you challenging yourself to switch up your reading habits in 2019? If you want a good Space book (well, trilogy) I can’t recommend The Illuminae Files by Amie Kaufman & Jay Kristoff enough. I devoured all three in a rush because once I had started I had to finish and they’re not like anything I have read before. Wow, that’s a helluva TBR! I’ll certainly take a look at a couple of the challenges – thanks for the links. Eleanor Oliphant was my favourite discovery this year, by turns hilarious and heart-breaking. I read Rebecca at school and it’s remained one of my favourites ever since. Well done on reading 70 books! That’s amazing! I think I only managed about 17 or 18. (Still better than last year’s 7, though, I guess!) I’m going to challenge myself to read lots more in 2019, though, so I may look in to some of these challenges- or at least use a few of the prompts to inspire my choices. Goodnight Mister Tom was one of my favourite childhood books (I was obsessed with it when I was about 10), and Anne of Green Gables is the loveliest read, so I’d recommend starting with either of those. I think you’ll love them! Thanks for the tip 😊 I don’t know what I’d do without my commute! Crikey 70 books! I think I managed three ha! I do love curling up with a book though, I need to make more time to do it in 2019. I’d be lost without my commute! It has its uses. Thank you for the shout out 😀 I really want to do the Penguin reading challenge too: it’ll have to be a New Years resolution!